Springtime is Southern Arizona at its most picture-perfect pleasant. With the tourist throng manageable in the tail-end of winter, you can be spared from the desert’s infamous dry heat. There’s something for everyone here, as these travel ideas in Tucson show. Choose one traveler identity or be them all! The free things to do in Tucson are also one of its most top-rated activities. Tucson’s architecture is a reflection of the region’s combined Spanish and Native American influences. 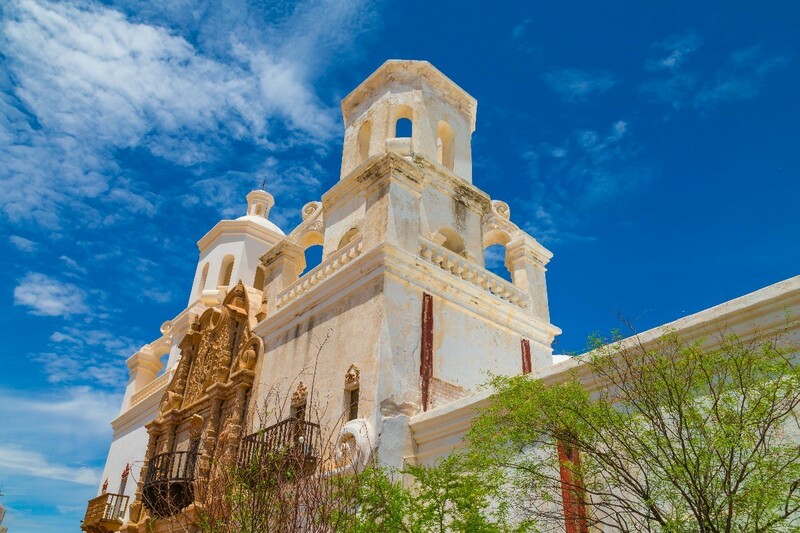 Also known as “The White Dove of the Desert,” the Mission San Xavier del Bac is a Jesuit-built Catholic church on the Tohono O’odham Reservation in the Santa Cruz Valley. If you’re famished from all the walking, hit up the heartbeat of Tucson. Chockfull of food and local goods, this year’s Fourth Avenue Spring Street Fair is from March 2 to 4, or settle with fiction to poetry, children’s books to fantasy and horror at the Tucson Festival of Books at the University of Arizona, from March 10 to 11. If you’re all about the active lifestyle, Tucson will not disappoint you with its plethora of outdoor opportunities. At the Saguaro National Park, get up close and personal with an American Southwest fixture: the Saguaro cactus. It can grow up to 60 feet tall and have as many as 16 arms. Hike the Saguaro National Park’s Signal Hill Trail to marvel at the prehistoric petroglyphs carved into boulders by the Hohokam Tribe. Then, detour into the Greater Phoenix area for the Cactus League Spring Training. March is when your favorite teams play games almost daily in different stadiums surrounding the state capital. This is sure to hit the sweet spot of any baseball fan in transit. Are you staying long enough that a side trip sounds feasible? It may be nearly four hours away by car, but the red rocks of Sedona are such a knockout, it’s worth it. To ease a body made sore by physical activity, book a jeep tour instead. Then, pamper yourself in any of the luxurious spa resorts within Sedona. You could even spend the night if you’re so inclined. How about a dose of culture on your itinerary? The Arizona State Museum is a behemoth not only in size, but also in history. Since its erection in 1893, it has amassed 3 million archaeological and ethnographic artifacts. The Arizona State Museum has the largest collection of Southwest Indian pottery in the world. On all Saturdays of March, they host a Master Artist Series where you can attend demonstrations by local crafts experts. If more recent art is right up your alley, then clear an afternoon for the Center for Creative Photography. Legendary photographer Ansel Adams was among the founders of this research facility and archival repository. Hung on its gallery walls are pictures by the brightest names in American photographic heritage, such as Edward Weston and Richard Avedon. If parents bring their kids to the vice paradise of Las Vegas, then Tucson can be just as versatile a vacation spot. The Old Tucson Studios is a theme park and film set where you can live out that saloon-and-tumbleweed Wild West fantasy. It’s high on the list of top fun things to do in Tucson. The historic tours, gunfights, and musicals in this cowboy town make it worth an expedition on horseback, but guess what? It’s only fifteen minutes away from the city center, so please use modern transportation! Next, make time for the Pima Air and Space Museum, a parking lot for cars of the winged and supersized variety. The planes themselves are a sight to behold, but should the jumpier members of your family itch for something to tinker with, the exhibitions can be interactive. Are these travel ideas in Tucson inspiring your next vacation? Satisfy your wanderlust this springtime! Let’s go to Tucson!